September 24, 1957: Little Rock Crisis: President Eisenhower sent federal troops to Arkansas to provide safe passage into Central High School for the Little Rock Nine. July 15, 1958: U.S intervenes in the Lebanon Crisis, the first major application of the Eisenhower Doctorine. January 3, 1959: Alaska was admitted as the 49th state. Senators are popularly elected statewide every two years, with one-third beginning new six-year terms with each Congress. Preceding the names in the list below are Senate class numbers, which indicate the cycle of their election. 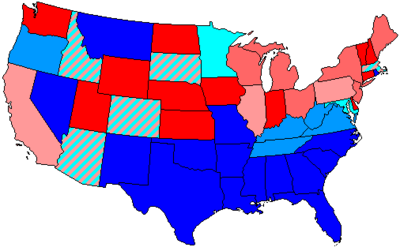 Senators in each state are listed by class. In this Congress, Class 1 meant their term ended with this Congress, facing re-election in 1958; Class 2 meant their term began in the last Congress, facing re-election in 1960; and Class 3 meant their term began in this Congress, facing re-election in 1962. (1) Price Daniel (D) Resigned January 14, 1957, after being elected Governor of Texas. (1) William A. Blakley (D) Interim appointee retired when successor elected. (1) Joseph McCarthy (R) Died May 2, 1957. (2) Matthew M. Neely (D) Died January 18, 1958. (2) W. Kerr Scott (D) Died April 16, 1958. (2) John D. Hoblitzell, Jr. (R) Interim appointee lost special election. House of Representatives Session Calendar for the 85th Congress (PDF). Official Congressional Directory for the 85th Congress, 1st Session. Official Congressional Directory for the 85th Congress, 2nd Session. Pocket Congressional Directory for the 85th Congress.